With an electorate of 717 million in 2009, 1.3 million electronic voting machines deployed in 834000 polling stations spread across the length and breadth of India, to elect 543 members of the Lok Sabha from among 8000 candidates contesting the elections, the General Elections in India held once every 5 years, is the world’s biggest election exercise. The responsibility for conducting these elections vests in the Election Commission of India. 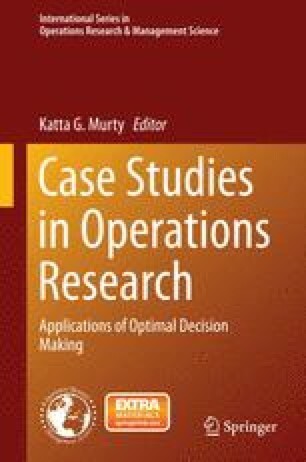 This chapter discusses the various decision making problems that they face in its organization, and efficient algorithms used to solve them. The online version of this chapter ( 10.1007/978-1-4939-1007-6_3) contains supplementary material, which is available to authorized users. Bureau of Police Research & Development. Data on police organizations 2009. BPRD (Ministry of Home Affairs, Government of India). http://www.bprd.nic.in/index3.asp?sslid=547&subsublinkid=204&lang=1. Accessed 6 Nov 2011. Murty, K. G. (1992). Network Programming. Englewood Cliffs: Prentice-Hall. http://ioe.engin.umich.edu/people/fac/books/murty/network_programming/.